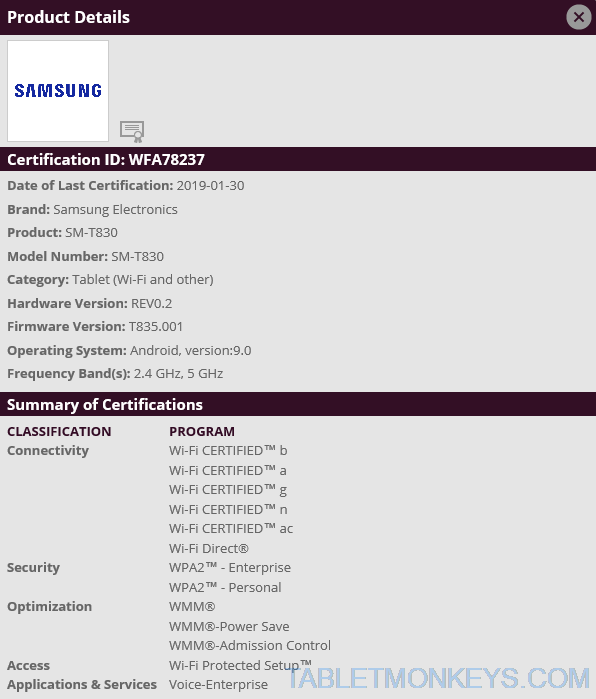 Good news for all Samsung Galaxy Tab S4 tablet owners, as the Android 9.0 update was officially certified by the Wi-Fi Alliance today, where Samsung got new certifications for their recalibrated versions of Samsung Galaxy Tab S4 Wi-Fi and 4G LTE models with model numbers ranging from SM-T830, through SM-T835, to SM-T837 (including all models with the letters A/X/R4/T/P/V/N/C added to the end of the model number). The last time we covered the Samsung Android 9.0 Tablet Update List, it looked like Samsung’s flagship Tab S4 would be the first of Samsung’s tablets to receive the Android 9.0 Pie update, and that the update should start to roll out in April this year. Samsung Galaxy Tab S4 10.5 was unveiled 5 months ago, and it’s still the leading Android tablet on the market, with no other other tablets on the market just now or tablets that have been leaked for the near future that could dethrone the Samsung Galaxy Tab S4.